"Mom, I treasure every moment with you. This is a symbol of how much I love you and how special you are to me." 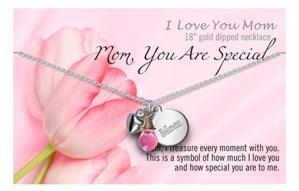 18" necklace with white gold dipped mom and heart charm with rose quartz charm.